WEATHER: a clear start, cloudy mid-morning with a heavy downpour. Sunny and hot from noon. Yala National Park covers a vast swathe of open countryside with large pools, dense scrub, .rocky outcrops and reed-fringed pools. Most of it is closed to the public but the area that you can visit holds all of the wildlife found in the rest of the park. We left the hotel at 5am and made it to the gates of Yala just before opening time at 6am. There were a dozen or so other jeep-carrying people ahead of us and it was still semi-dark as we entered the Park tracks. 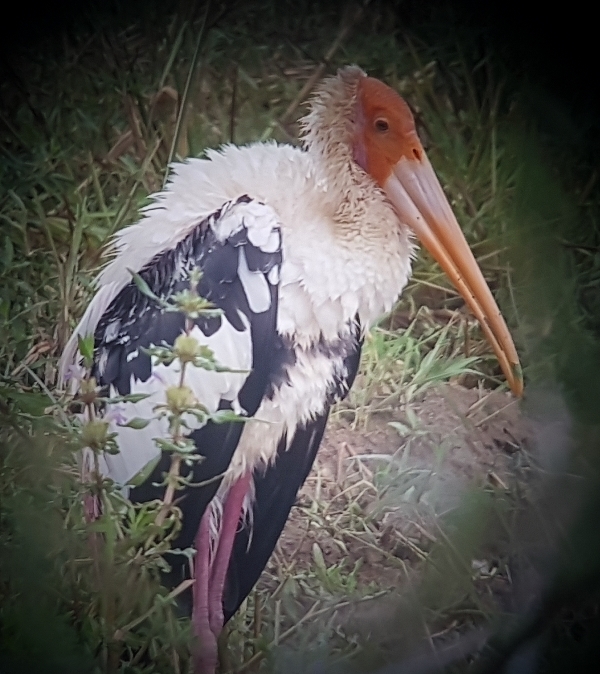 As we passed the first of many open pools, we started seeing Herons, Egrets and the impressive Painted Stork with the smaller Asian Openbill. As it got li it was evident that rain clouds were gathering ahead of us but we managed a good hour or so before it started. In the meantime we found a few waders such as: Common Redshank, Common Sandpiper, Black-tailed Godwit, Black-winged Stilt, Marsh Sandpiper and a pair of Painted Snipe. We also added Eurasian Spoonbill to our list and got much better views of a lot of other species. Common Kingfisher joined White-throated and Pied Kingfisher on both the day list and the trip list. The rain came down in buckets and as we were in an open vehicle some of us got a partial soaking, but it didn’t last more than 30 minutes and soon the clouds had cleared. Mammals appeared everywhere and although our priority was bird watching we still hoped for a Leopard sighting. Other mammals seen include: Black-naped Hare, Ruddy Mongoose, Spotted Deer, Indian Buffalo, Grey Langour, Toque Monkeys, Wild Boar our Indian Elephant sighting came later. A few Mugger Crocodiles lay in the pools and several Land Monitors walked across the track during our morning drive. One piece of excitement happened when a small party of wild Spotted Deer started giving out their alarm ‘bark’ and the Grey Langour Monkeys started calling loudly. Our driver explained that it was the presence of a Leopard that was causing the alarm, after searching the area we never saw the Leopard. However, during this stop we found a pair of the bizarre looking Malabar Pied-Hornbill, what a bill that dude has! At 9am we stopped to eat our packed breakfast, a designated area had toilets and gave us the chance to climb down off our vehicles and stretch our legs. 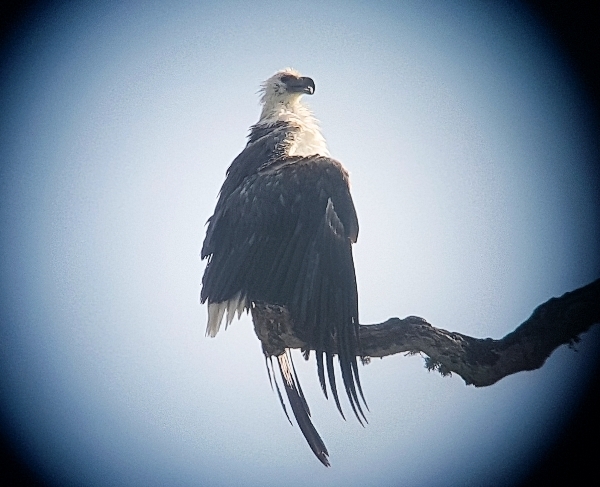 We saw Woolly-necked Storks, Stork-billed Kingfisher, White-bellied Sea-Eagle and Saman our guide pointed out the call of the Drongo-Cuckoo but it never showed. We saw a Grey-breasted Cuckoo on the way out of the picnic area. Soon after the picnic break saw our only Sri Lanka Elephant and then we got lucky and found a Leopard sitting in a tree, it was sat upright giving great views but too far away for a photograph. 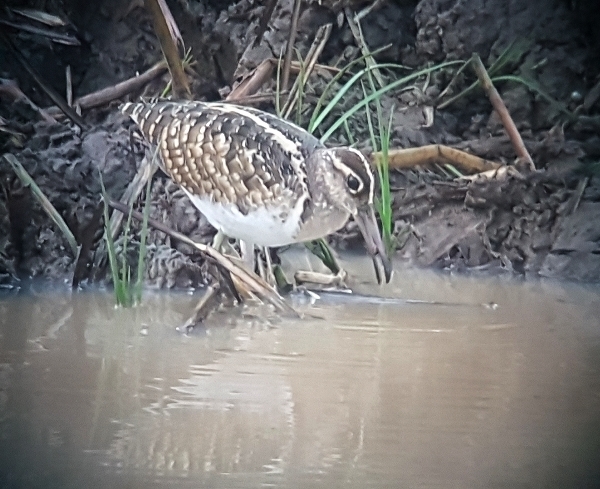 We then had a nice stop at another pool where we found Painted Snipe we also found several nice passerines during this part of the morning. 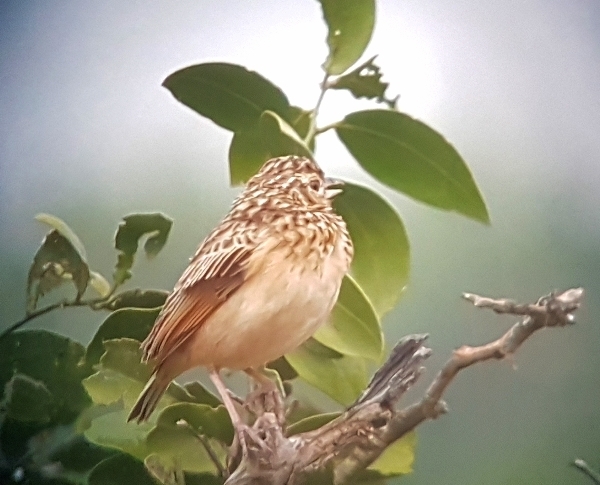 Jungle Prinia, Brown Shrike, Woodshrike, Coppersmith’s Barbet, Streaked Weaver, Jerdan’s Bushlark, Richard’s Pipit, Eurasian Hoopoe and many more. Every second of the trip there were Bee-eaters and Swallows in the air, the Green Bee-eater seemed to be on every bush. 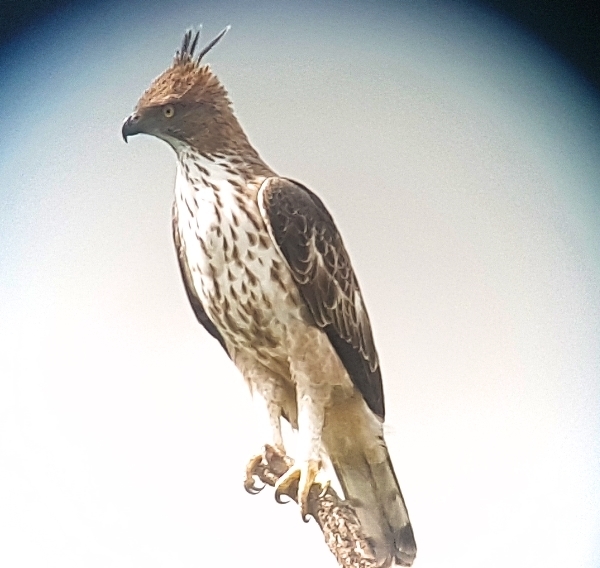 Because of the rain a lot of raptors sat out on top of dead trees drying their wings we saw several Crested Serpent Eagles, also Grey-headed Fish Eagle, Crested Hawk-Eagle, Besra a Common Kestrel and a few more White-bellied Sea-Eagles. On the way out of the park we stopped to watch a couple of Brahminy Starlings, they were really close to the jeep and gave extraordinary views, what a fantastic looking bird. The last excitement was caused by a Blue-faced Malkoha, this bird flew across the track in front of us and perched in a nearby bush, the view wasn’t great, but we all saw some of it. After our long lunch we spent the afternoon visiting two more of the ‘ Tanks’ not too far from the hotel. It was a bird filled afternoon I couldn't believe how birds were present, you could them as far as the eye could see. The first thank produced our first sightings of Little Grebe, Caspian Tern, Cotton Pygmy Goose, Garganey Ducks and a host of other birds. We really enjoyed Terns, waders, egrets, herons, Ibis and more waterfowl than you could shake a stick at. It was a little windy at the first place but it was just fine at the second tank, no wind and a lovely temperature. New species for our list came thick and fast, it really was quite overwhelming to see so many species in such a small area and in a short time. 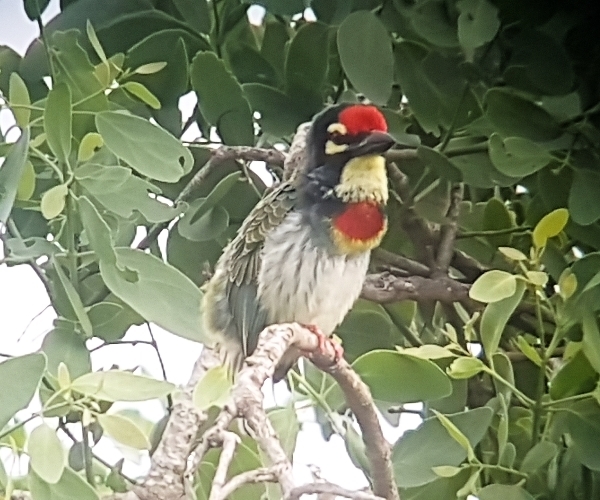 We first saw Rose-coloured Starlings, the Indian Silverbills, followed quickly by Marshall’s Iora, Ashy-crowned Sparrow-lark, Paddyfield Pipit and Coppersmith’s Barbet. Phew! Indian Thick-knee soon followed and that was all before we started looking at the Tank. Several small pools held a host of waders, we found about a dozen species in quick succession and many of them were new for our list. If you like wader watching then this was your kind of heaven, Little Stints numbered in their thousands, hundreds of Kentish, Lesser Sand-plover, Little Ringed Plovers, Redshank, Godwits, Pacific Golden Plover, Wood Sandpipers and several other species were just right there in front of you. We stayed a couple of hours, it was magical with the fading light, streams of egrets, storks, Ibis, herons and cormorants flying off to their roots. A large gathering of Terns appeared and we found both Common and Little Terns, both of which were new for our list. As it got dark we walked slowly back towards the bus, an Indian Nightjar started calling and within minutes one landed on a post just 2 meters from us, what a great bird to finish off a fabulous day. However we were not finished yet because back at the hotel wee heard a Jerdon’s Nightjar calling, it flew right over the top of us in the middle of the hotel grounds, just fantastic. We are dinner at 7:30 and then called the bird log, we had seen 114 birds today, it was amazing count.